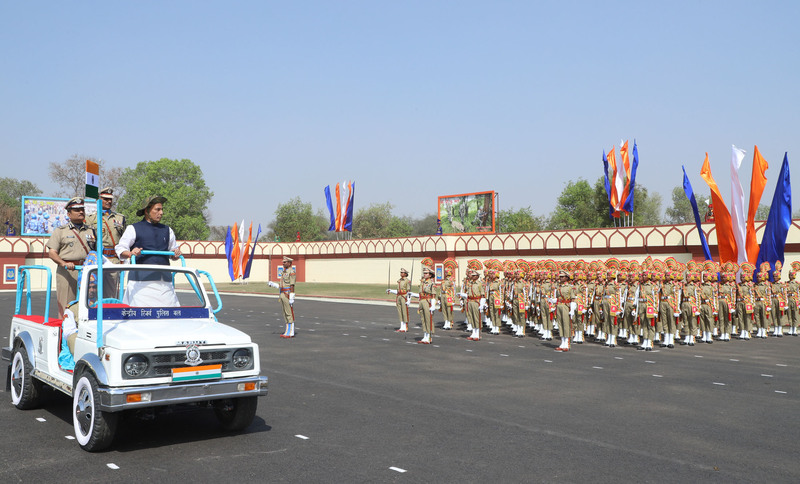 The Union Home Minister, Shri Rajnath Singh inspecting the parade at the CRPFs 79th Raising Day function, in Gurugram, Haryana on March 24, 2018. 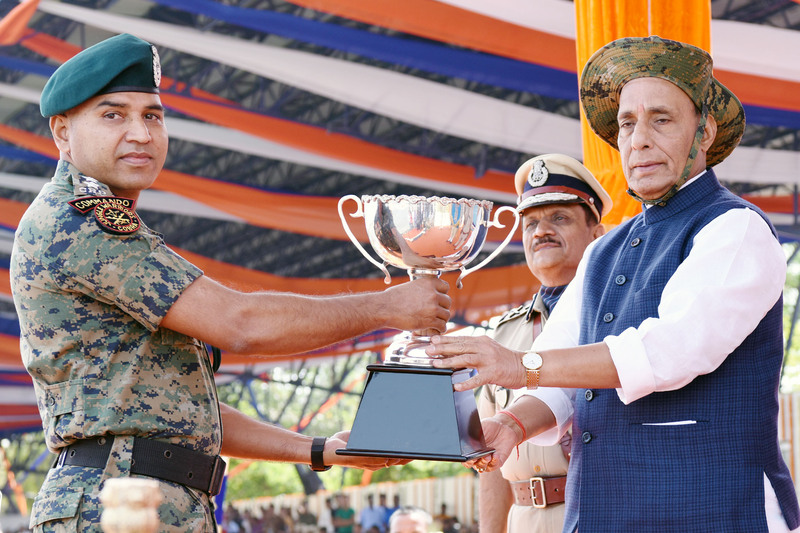 The Union Home Minister, Shri Rajnath Singh presenting trophies on the occasion of CRPFs 79th Raising Day Parade, in Gurugram, Haryana in March 24, 2018. 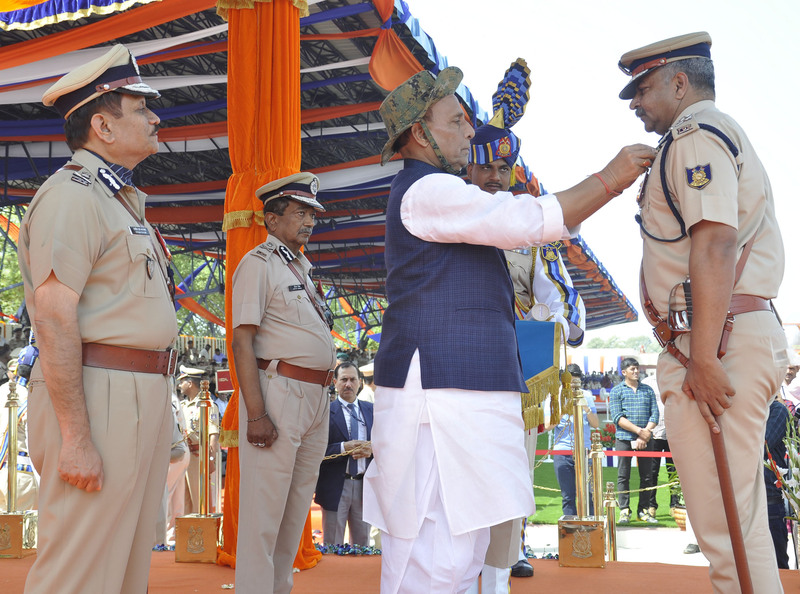 The Union Home Minister, Shri Rajnath Singh presenting Police Medals for Gallantry on the occasion of CRPFs 79th Raising Day Parade, in Gurugram, Haryana in March 24, 2018. The Union Home Minister, Shri Rajnath Singh presenting President’s Police Medals for Distinguished Service on the occasion of CRPFs 79th Raising Day Parade, in Gurugram, Haryana in March 24, 2018. 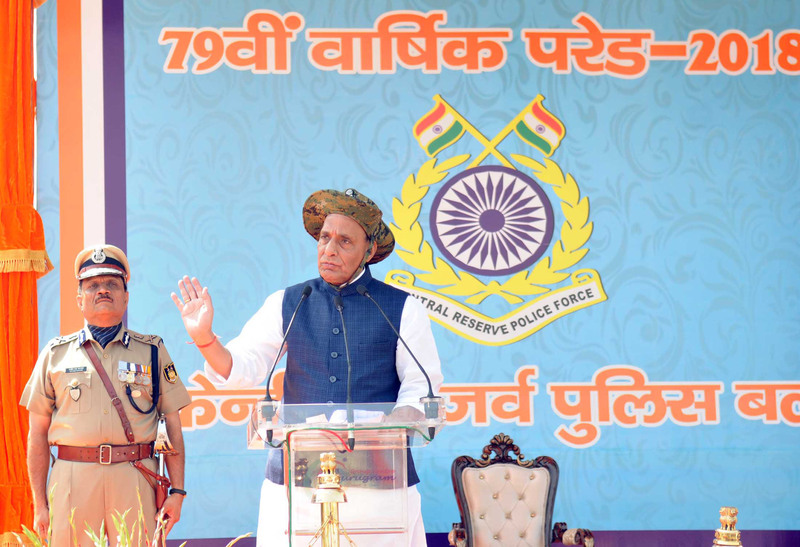 The Union Home Minister, Shri Rajnath Singh addressing at the CRPFs 79th Raising Day Parade function, in Gurugram, Haryana on March 24, 2018. 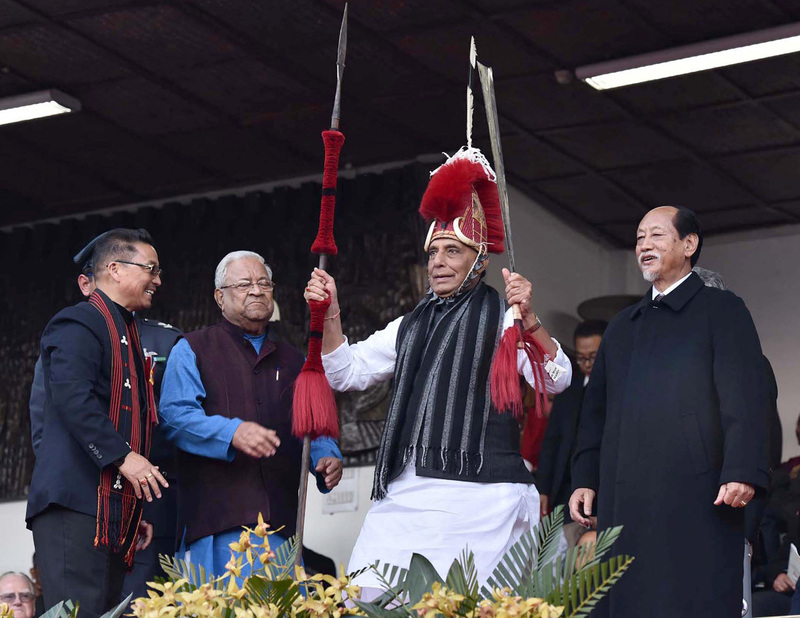 The Union Minister of Home Affairs Shri Rajnath Singh today praised the contribution of CRPF in meeting various security challenges posed by terrorism, leftwing extremist violence and insurgents in the North East. Shri Rajnath Singh was addressing the Force personnel at Gurugram on the occasion of Force’s 79th anniversary. Shri Rajnath Singh recalled several incidents where the valiant Jawans of CRPF successfully thwarted miscreants’ evil designs and said the country is proud of the CRPF. He said the Force played a prominent role in ensuring safety and security which is a prerequisite for the economic development of the country. He said CRPF was successful in inflicting heavy losses on Maoists who were using tactics of desperation as the battle is in the final stages. He urged the Force to inform the people of Government’s development programmes while highlighting anti-development activities of the Maoists. Highlighting the multidimensional role of the Force, he said whether it is Jammu and Kashmir, Leftwing extremism, the North East, Elections or Internal security, the country looks up to the CRPF. The Union Home Minister added that CRPF was not only organising Civic Action Programmes, but also taking active part in Swachhata Abhiyan, Beti Bachao Beti Padhao Abhiyan and encouraging digital transactions. 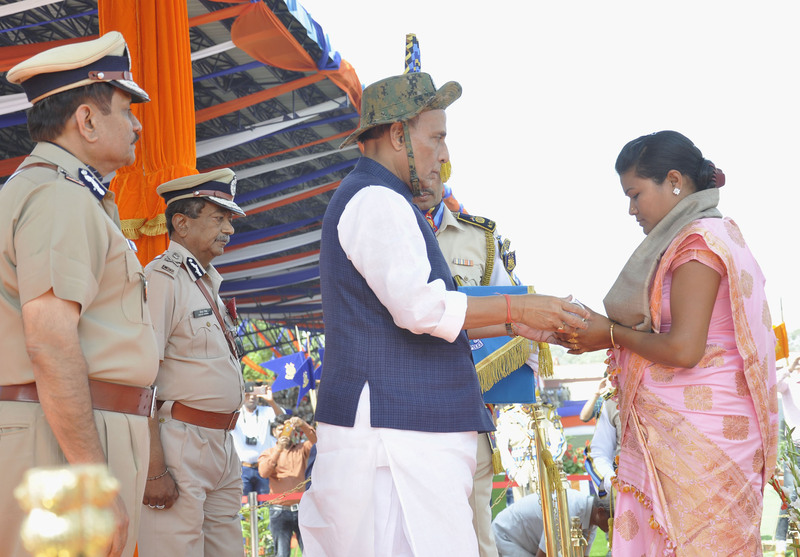 On the occasion the Home Minister presented medals and citations to the kins of martyrs and other personnel of the force for their commendable performance . Earlier the Home Minister inspected the CRPF Contigents and took the salute. Earlier Speaking on the occasion, Shri R R Bhatnagar, DG CRPF touched upon various valiant deeds performed by the force personnel since it began its journey in 1939. He said that due to the active involvement of the force in J&K, LWE areas and the North East, as many as 172 terrorists and many Maoists have been neutralised during the last one year alone. He assured that CRPF will always rise to the challenge of internal security and come out with flying colours. The ceremony came to a close with a splendid show of acrobatics and the impressive daredevilry of the CRPF canine squad.